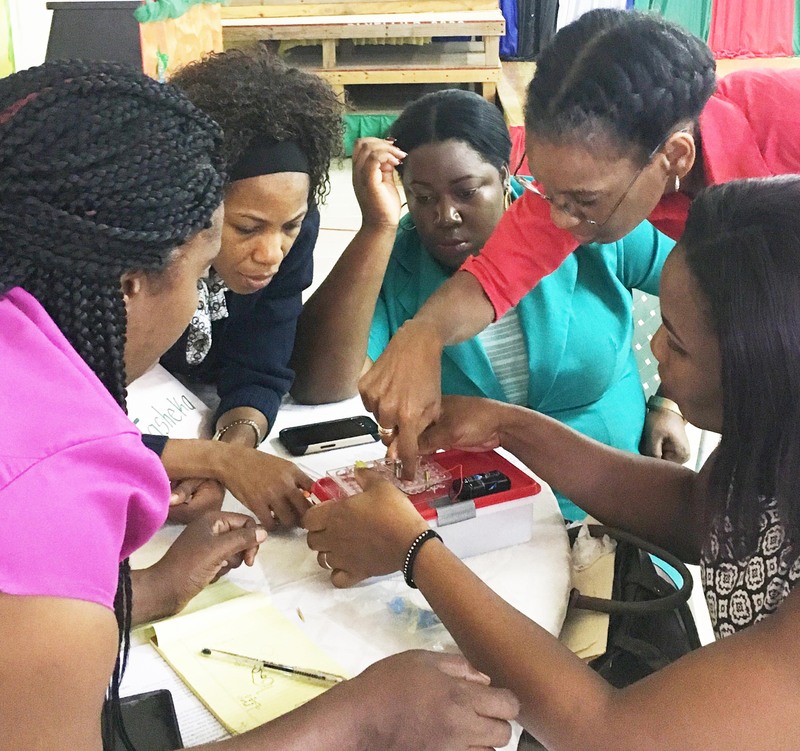 The Caribbean Science Foundation (CSF) and the Caribbean Academy of Sciences (CAS) jointly hosted STEM (Science, Technology, Engineering and Math) Teacher Training Workshops for primary school teachers at the Genesis Academy, Kingston on January 9-10, and at the Wexford Hotel, Montego Bay on January 12-13. The two-day workshops which served a total of 42 teachers were made possible by grant funding from the Embassy of the United States of America to Jamaica, as well as through the cooperation of the Ministry of Education of Jamaica. Professor Cardinal Warde (MIT) and Ms. Lois Oliver of the CSF were the workshop organizers. The goal of the STEM Teacher Training Workshops is to train teachers in the use of Problem Based Learning (PBL) and Inquiry Based Science Education (IBSE) as teaching tools. Teachers are selected by their relevant Ministries of Education, and have a passion for increasing their students’ level of interest in the sciences. These teaching methods introduce the basics of the scientific method to the young students, and promote their interest and excitement in science and engineering. A longer-term goal of the STEM Teacher Training Workshops is to increase the number of students focusing on the sciences at the secondary level. The PBL/IBSE teaching tools include UNESCO-approved micro-science kits, and emphasize observation and experimentation, while drawing on the child’s own knowledge. The training was provided by experienced CAS facilitators, including Dr. Winston Mellowes – Professor Emeritus, UWI St. Augustine, Dr. Rowena Kalloo – UWI St. Augustine, Mrs. Petal Jetoo – National Science Coordinator Ministry of Education Guyana, Dr. Cathy Radix – UWI St. Augustine, and Professor Bhuall Nand Kumar – NYIT. At the opening ceremony in Kingston, Prof. Warde (who is also the Interim Executive Director of the CSF) said to the gathering of teachers, facilitators and Ministry of Education officials that “… it is the CSF’s vision that these teaching tools and methods will lead to higher numbers of students pursuing advanced degrees and careers in science and engineering and, ultimately, help to develop the Region’s next generation of technology leaders.” The CSF donated one micro-science kit to each teacher for use in his/her school. Previous workshops in 2015-2016 have been held in St. Vincent, Antigua, Jamaica and Barbados.